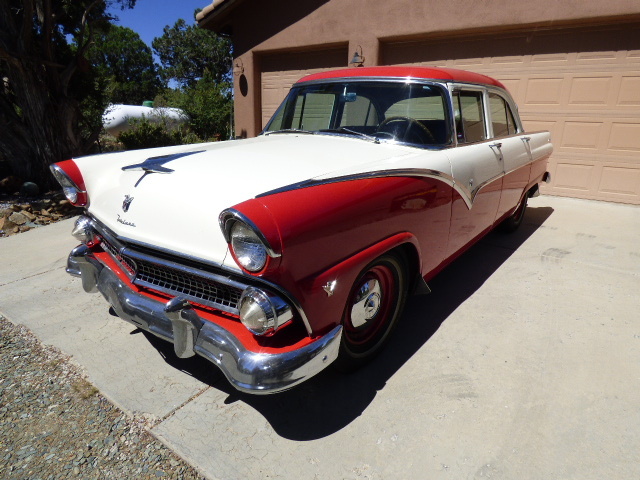 Offered for sale in Prescott, Arizona is this very nice 1955 Ford Fairlane Town Sedan. The current owners have enjoyed the car for about 13 years, or so. They purchased the car from a local Classic Car Dealership in 2004. If you are looking for a nice Classic Sedan that you can use regularly, take to car shows with your family, and turn some heads wherever you go, this would be a good choice. 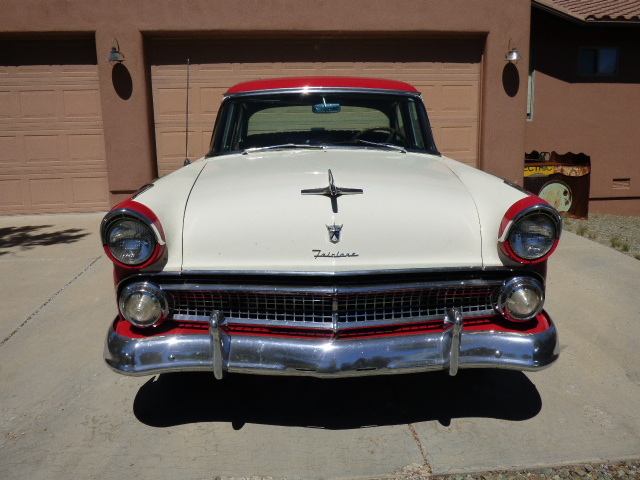 I drove the Fairlane the other day and she runs and drives like a dream. Upgraded power front disc brakes provide excellent braking, the powerful V-8 gets up and running with ease. The clutch and transmission operate smoothly. She still has her original 6-volt electrical system, vacuum wipers, radio, and heater. Lights and signals are all working properly. The odometer has been rebuilt and shows 12319 miles since the repair. Under the hood is the Ford 292 V-8 with “Thunderbird Special” on the valve covers. As an optional upgrade, this engine adds an additional 10% or more to the value of this great Sedan. The fuel tank and lines have been previously flushed and an electric fuel pump has been added to the fuel system. Additional attention has been given to maintenance items such as; Cables, hoses, belts, wiring, lights, signals, wipers, tires, spare tire and jack, and radiator. When I looked at the Interior I was pleased with how nice it all is. The Seats, Carpets, Headliner, Door Panels, Dash, etc. are all in very good condition. For your safety, Seat Belts have been properly added. There are a few flaws here and there. Overall the car is in very good “driver” condition and should serve you very well for years to come. My clients have placed the car for sale with KumberaMotors.com in hopes that she will find a new home. Please scroll down to see all the pictures and descriptions. Call Jim McLeod at (928) 710-7101 or e-mail at KumberaMotors@gmail.com with your questions or comments. This is a Private Party Sale. Price: 12,500 OBO - Sold in 24 hours from original post! Really a nice looking car. Very sound, mostly original, reliable, and fun to own and drive. Safety upgrades include the Power Front Disc Brakes and Seat Belts. There is a small chip in the windshield and a few flaws here and there in paint. The chrome and stainless trim is all there and very straight. Some re-chroming could be done, but really the car is a great classic driver as is. She shows well. The interior is so nice and very comfortable. I like that they added the seat belts for safety purposes. 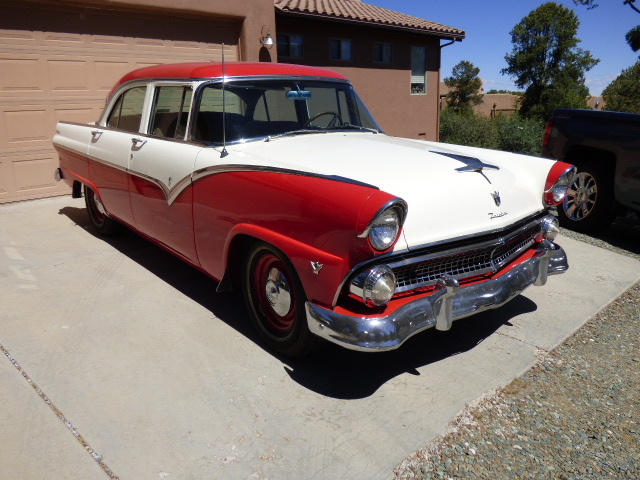 I can't emphasize enough the fact that this Fairlane has so many positives. It was a joy to take her out for a spin. Under the hood is the "Thunderbird Special" 292 cubic inch V-8. The 6-volt electrical system is still intact and fully functional. Many of the cool original items are still here; Wiper Fluid Bag, 6-volt Generator, vacuum wipers, Special valve covers, and more. Very clean and stock looking under the hood. I like that a lot, not all customized. Most of the parts for this car are still readily available, too. Trunk is clean and neat.